Frontline Plus provides protection against fleas and ticks, and contains a special ingredient to kill flea eggs and larvae. By stopping the development of new fleas, Frontline Plus provides the most complete flea and tick protection available. Frontline Plus kills 100% of fleas and ticks within 48 hours, including many ticks that transmit dangerous diseases that can affect other pets and humans. Frontline Plus Flea Control has been formulated for use on puppies and kittens from eight weeks of age and is safe for use on pregnant and lactating animals. It is a water-resistant flea medication, so it continues to kill fleas even after shampooing, swimming, rain or exposure to sunlight. N.B. Pet Shed sells the Australian versions of the products listed below. Frontline Plus has been approved for sale in Australia by the APVMA. The US equivalent of this product has been approved for sale by the EPA. Both the Australian and US products contain the same active ingredients, Fipronil & (S)-Methoprene. However, the products sold by Pet Shed are sold in Australian packaging which has not been approved for sale in the US. As a consequence, the Australian packaging does not have EPA approval and the sale and purchase of products in the Australian packaging may be illegal in the US. If swallowed call a poison control center or doctor immediately for treatment advice. For hazards to domestic animals the 24 hour assistance line within the U.S.A. is 1-800-660-1842. The Product Information Schedule above indicates some of the material differences between the Australian and U.S.A. versions. 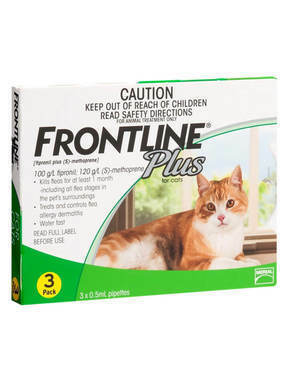 Been using Frontline for years on my cat. No fleas or ticks.! Ticks and fleas were really bad last year. Had several on us when we went walking but none on my cat. Really works great. Although she is inside most of the time she loves to be outside when it is warm. Frontline keeps those critters off. Used another product - dog appears to be allergic to it - going back to Frontline. I have used this product for over 10 years and it has never failed me. My cats and dogs love it and stand perfectly still for me to apply it every month. Being able to get it at such a great price is just awesome! I am very happy with the results of applying Frontline Plus to my 12 lb rat terrier. We live in an area with lots of deer ticks that transmite Lyme dissease and he has been healthy for his 10 years of life this far. I only apply Frontline Plus every two months. My dog also receives at the vet's office the Lyme dissease vacine once a year in the spring. Frontline Plus costs a little more than othe similar products but I will not change it. I save money by ordering Frontline Plus on line to Joe's Pet Meds, and it always arrives. I have been using Joe's Pet Meds for 11 years and they have the cheapest and best Frontline Plus Prices......I would recommend them to anyone and do to all the people that adopt mini Dachshunds from me. Thanks Joe's Pet Meds. I have 6 smaller dogs and I've been using both Frontline Plus and the generic for about 10 years. I find that if I buy in the largest size, I can split the dosage among all 6 dogs. They have never had a flea among them. I live in Maryland in the USA and it's hot here in summer. Fleas can be a real problem. I highly recommend Frontline Plus and the generic. They work. If you have a severe flea problem, it is wise to first have your dogs bathed before you apply the liquid. I also have my dog yard treated for fleas with Sevin powder in the spring. So far, so good. You will save a lot of money if you purchase your dog supplies here. I have been doing so for MANY years. I recommend them all of the time. I have been using this product for several years now and have had no problems, as far as I'm concerned it works great and I would recommend it. I would also like to mention, last yr. when I placed my order for a 12 pk, after 3 weeks(15 working days) it still had not arrived. I contacted customer service and they immediately send out a second order. Both orders then showed up within 3 days of each other. After contacting customer service again to let them know, they gave me the option of keeping the second order and paying for it or returning it. I opted to return it. 5 stars for customer service. Thank you.